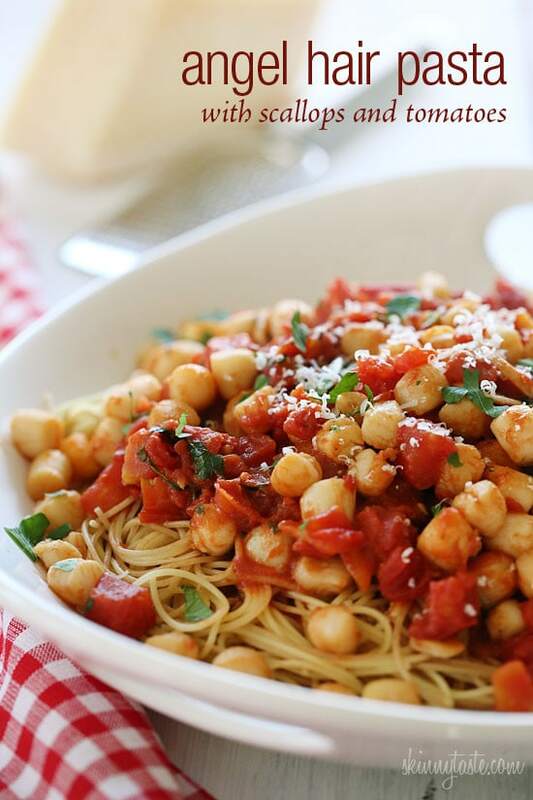 Sauteed bay scallops with tomatoes and a touch of white wine and lemon juice served over angel hair pasta. More of my favorite seafood pasta dishes are Linguini and Shrimp Fra Diavolo and Linguini with Sauteed Scallops and Peas. If you’re looking for a special dinner to make for your loved one this Valentine’s Day, this is a perfect dish. For starters, it takes less than 15 minutes to make, so you’ll have less time cooking, and more time together. Secondly, scallops date back to ancient Greece as an aphrodisiac. As legend has it, the goddess Aphrodite was carried to earth on the shell of a scallop. Personally, I love scallops for their sweet, delicate flavor. Bay scallops are the smaller variety and are usually less expensive than sea scallops. They are wonderful tossed with pasta and take less than a minute to cook. 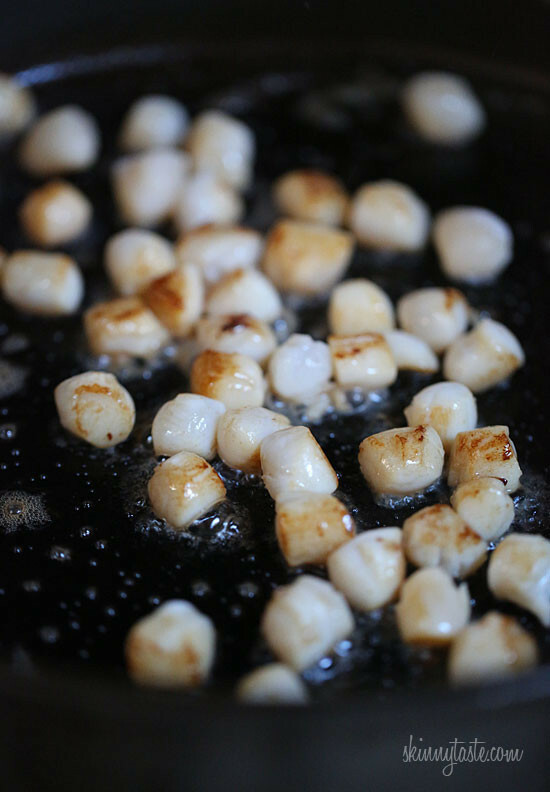 Because bay scallops retain so much water, it’s really important that you dry them well before cooking, and you really want to cook them in a hot pan so you get a quick sear. I cook them in 2 or 3 batches depending on the size of my pan. Don’t skip this step because you don’t want to overcrowd the pan, otherwise the scallops will become rubbery and won’t sear. If you’re family doesn’t like whole wheat pasta, a great trick I like to do is use both whole wheat and semolina. You don’t really notice the taste of the whole wheat and your getting the added benefits of using a whole grain. For all you spaghetti squash lovers out there, I’m sure this would be wonderful over roasted spaghetti squash as a gluten-free, lower-carb alternative. *Use brown rice pasta or quinoa pasta for gluten free. Meanwhile, heat a large heavy-bottomed skillet on high heat. When hot, add 1 tsp of oil and the butter over medium-high heat until mixture starts to brown. MAKE SURE THE PAN AND OIL MIXTURE IS VERY HOT – Transfer HALF of the scallops to the skillet and cook WITHOUT MOVING until seared: ABOUT 30 SECONDS. Gently flip and sear on other side for another 20 – 30 SECONDS. Remove from skillet and set aside; cook remaining scallops and repeat as the first batch; set aside with first batch. 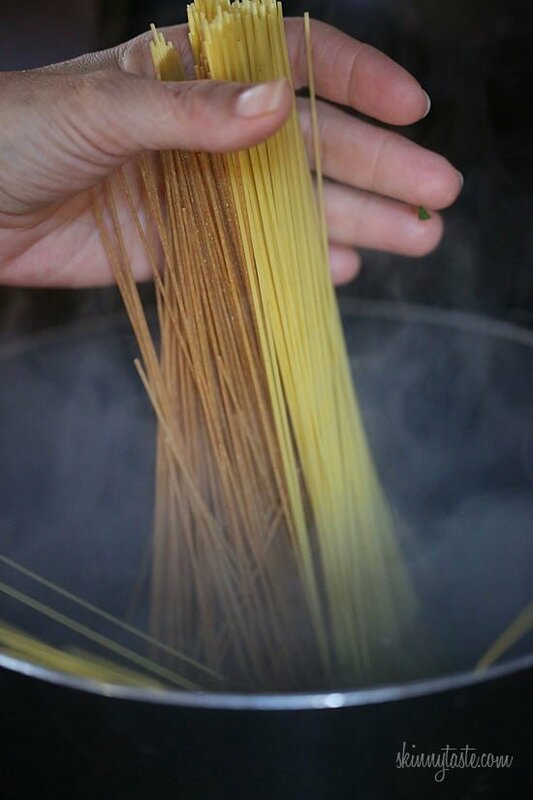 Add the angel hair to the boiling salted water, cook according to package instructions for al dente. Reduce the skillet to medium-high heat; add remaining teaspoon of oil. When hot add the garlic and cook 1 minute. Add the tomatoes, wine, salt and pepper and cook an additional 2 minutes. 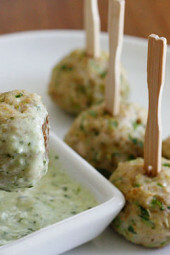 Add lemon juice and 2 tablespoons of parsley, remove from heat. Drain any liquid that accumulates from the scallops, then add the scallops to the skillet and remove from the heat. Drain the pasta and place in a large serving bowl. Top with the scallops and sauce, more fresh parsley and serve with grated parmigiano if desired. Huge hit with my Dad who is recovering from surgery and asked for something with pasta, tomatoes and scallops! Whole family enjoyed it immensely and asked for the recipe. I used sea scallops which took longer to cook (30 – 40 mins total rather than 15 mos) but was delicious!! Highly recommend. This turned out so good! My family loved it. It was flavorful and easy to prepare. We did add some sliced olives to it for a bit of color. We will definitely be making this again. This is literally one of my favorite dishes I’ve ever made and I cook a lot. So tasty!! I didn’t have white wine on hand so I used red and it worked beautifully. The sauce is amazing, I could eat it without the scallops and still be happy. Thanks, Gina! This was my first time making this & honestly, I did make a few minor mistakes like leaving the garlic in the pan for a little too long, but you couldn’t even tell when you throw everything in together! I really like bay scallops. Maybe more then the large ones. I added some more veggies to this dish. Birds eye frozen artichoke hearts, chopped left over asparagus, and some chopped fresh spinach. I used juice from 1/2 a lemon and some added spices from Penzey’s- Mural of Flavor and Old World. I used House Foods tofu noodles for me and made whole wheat angel hair pasta for husband. We both declared it a favorite recipe. I've made this a few times …. so delicious!!! And the family didn't notice the difference in pasta when I mixed semolina with whole wheat pasta. So yay! Get real Scollops, not the fake bay ones. super yum 🙂 I've only tried cooking scallops once before, with the bigger kind… no bueno. the smaller kind was much easier and came out perfectly tender. thanks!! So So good! I made mine with shrimp instead of scallops! Very quick and easy. The best part is my kids liked it! I love scallop pasta and yours is worth trying. 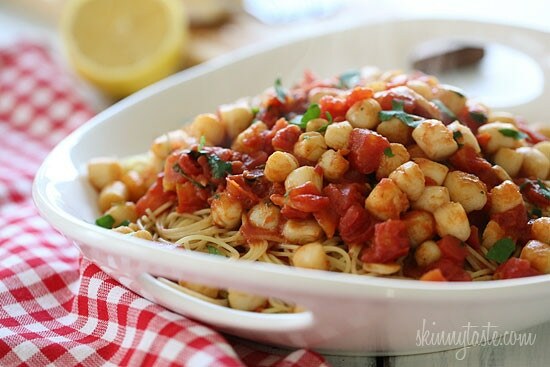 I made this vegan by using chickpeas instead of scallops. It was so delicious that I'm cooking this for my second time since your post! Is there something I can use as a substitute for the wine in the recipe? This recipe sounds so yummy, but I just can't use wine. I just made this… There were a few substitutions. I had already cooked shrimp that was thawed out from yesterday, I heated it up in a skillet with a little evoo. In the other pan, I made the sauce exactly like the recipe called for, except I added frozed chopped spinach (that I microwaved real quick). I added the cooked spinach and the heated shrimp to the sauce and it was absolutely delicious! Yummy! Thanks Gina! Love your recipes! Can you use frozen bay scallops for this? Made this tonight…..I was a little hesitant because I had never cooked scallops before, but it looked so good! It was amazing!! So light and fresh! I LOOOOOVE your website. I always come here first when I'm looking for a delicious, skinny recipe. Thanks so much, Gina!!! Really great recipe. Next time, I'll slice the garlic and parsley before hand, and not get the oil so hot; whoops! How do you think it would taste re-heated? My husband doesn't eat scallops, so I'd be cooking this just for me. I'd cut the recipe in half, but I'd still have leftovers. I just don't want the scallops to taste funny the next day. JUST made this and IT was amazing, Gina!! I love scallops and I used gluten-free pasta and it came out great. I made this for Valentines Day and it was delish! We made it with sea scallops, instead of bay scallops, so they had to cook a bit longer. Overall, I would definitely make this again! And I loved that it was so quick! Oh my gosh, my husband said this was the best thing I have ever made. This is an amazing dish! I want more recipes with these delicious little things! substituted shrimp and served with Gina's cheddar garlic biscuits. i had a very happy fiance! I love scallops! This looks out of this world delicious! I saw this on Facebook this past week and knew my family would love it…and they did! I used sea scallops and added shrimp (two picky eaters that ate the shrimp) and it was so delicious! Thank you Gina for all of your great recipes! I've been cooking things off this blog since I started my diet and January, but this is the first time I've commented. I've never had scallops before so I just tried this because it looked really good, and it surpassed my expectations. The tomato mixture is amazing. Just made this recipe. It was so delicious!! Thanks for sharing! I made this last night and it turn out so good, thank you for your blog I love it!!! I loved this! I made it with Whole Wheat Spagetti to make it more low carb, but I could just eat the scallop mixture. Thanks for the amazing recipe! Made this last night, thank you so much! It was delish! Next time I make it I believe I will add in some fresh basil from our yard vs the parsley, even though it was wonderful. I did not have white wine so I used chicken broth, and it was very good. I also used veggie pasta instead of the wheat. Uhh made this tonight it is so good! I added some shrimp. Sneaky Sneakerson! I love your deceptive ways… I'll have to try your pasta trick just to trick myself. I will definitely try this. Did not know the difference between bay scalops and sea scallops. I learn so much from your site and love cooking your recipes. I have sent your site to my brother in law in France. I am from Canada and have a hard time to find the low fat cheeses. Any idea about equivalent cheese that you use in your recipes? I am in Canada too, and I find that President's Choice Blue Menu line (carried at Loblaws)offers up a lot of low fat cheeses. We use their low fat shredded cheddar and their low fat goat cheese. I don't drink wine so I never make recipes that this is an ingredient BUT I would like to make this one. What white wine do you use?? This looks great! Can you use shrimp and would it change the WW points? I used 12 oz raw, deveined, tail-off shrimp which I think is 8PP. I believe that 1lb raw scallops is 9PP, so I think that's pretty much equivalent. Made this last night–couldn't find sea scallops at Super Target so I substituted shrimp and it was great. I did have a bit of an "I Love Lucy" moment where I got the pan too hot before adding the oil. There was smoke everywhere! Thank goodness stainless steel is not too hard to clean. Great recipe, Gina! What a lovely dinner! This one is going in the recipe box for sure! My husband is allergic to scallops but can have other seafood. Do you have a seafood alternative that wouldn't change the points value? Please let me know! Would love to try it out! I think I'll try this with spaghetti squash instead of pasta! I don't have a sweetie for Valentine's Day this year, but I think I'll make this for myself and treat myself to something special. Thanks for the great recipe! As always you've come up with another creative (and healthy) spin on pasta, can't wait to try it! Oh wow, this looks so amazing! I love scallops and with pasta? Perfection! This sounds just fantastic! I like your idea about mixing the two different pastas as well and not tasting the whole grain one. Thank you for that suggestion. Made this tonight. Was easy and good. My husband said "I'd eat this again." Thanks for ALL of your recipes. For the first time in a long time I feel like cooking again because you have so many healthy AND yummy options. Keep 'em coming! I agree. Gina because of you my weight watchers journey has been simply marvelous. 13 lbs and counting. 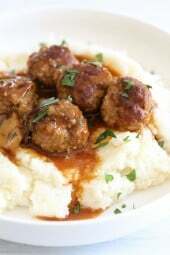 Such a lovely dish – easy, elegant and super flavorful! Looks so delicious Gina! 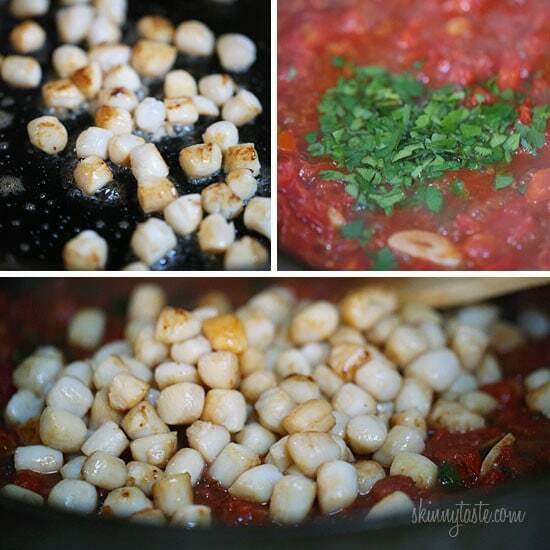 I need to make these scallops now! Yum! I always forget about bay scallops! I usually cook up sea scallops but you are right the bay scallops are better for a pasta dish! Thanks for the reminder and the great recipe! Can you tell me what the points would be if I used Smart spaghetti? My husband doesn't eat ANY food from the sea. 🙂 What would be a good substitute for the scallops? chicken would work if cut small. Delicious. I will try with either spaghetti squash or ribbons of zucchini. Thank you! 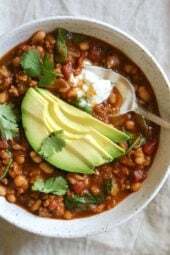 Love the simplicity of this recipe! I've never had bay scallops. I think I would actually like them better than regular sized scallops. Can't wait to give this a try! I make something similar to this but with heavy cream – i LOVE that this is a healthier version! I will replace my old recipe with this one. One more reason i love this site!! funny, they kind of do, bet that would work for a vegetarian option! That's exactly what I thought when I first saw the picture! Oh man, I totally thought they were chickpeas. I kept thinking, Why aren't there any pics of the scallops? 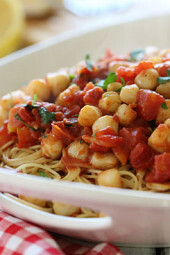 I'll be making this sans scallops, with chickpeas and spinach. This plain just looks good. We love bay scallops….little juju beans from the sea. With my WW calculator, this recipe comes out to 8 Points Plus. The wine makes it 9 pts plus. Is the wine super essential or can i substitute it with something else? Or can i just leave it out with nothing else added? btw.. can't wait for 2014 for your cookbook!! DEFINITELY buying it! Looks SO amazing! I just love scallops!